Our Sony BDP-S5100 review reveals a shimmering 3D Blu-ray player with apps, smarts and a 'sense of quartz', but is the lack of 4K scaling a problem? If this smart Blu-ray deck's tinted and oddly tilted bodywork does'ít catch your eye, its feature set might grab your attention. 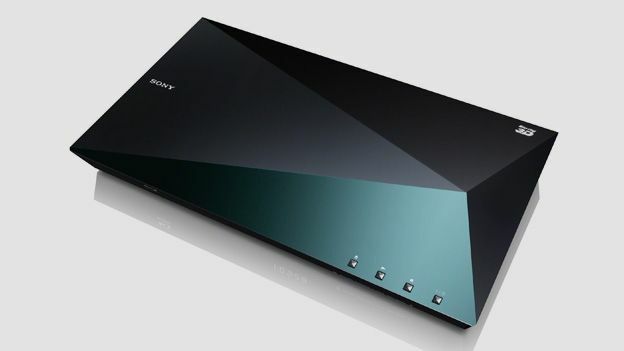 In addition to 3D playback with 2D-3D conversion, the modestly priced Sony BDP-S5100 Blu-ray player also boasts SACD compatibility, Triluminos colour and inbuilt Wi-Fi that unlocks a wealth of free apps and online content. The only thing missing is Ultra HD upscaling, offered by the similarly priced Panasonic DMP-BDT330. But then if you can afford a 4K TV, you will presumably be looking at premium players like the Sony BDP-S790 deck, which of course does output the full UHD monty. Does it have what it takes to make it into our list of the best Blu-ray players to buy? Look beyond the alluring sense of quartz' design that runs through this and a few other Sony home cinema products and you'll find a mid-range deck with plenty of features. 3D playback doesn't have the same draw that it did a year ago, but 2D-to-3D conversion sets it apart from most other 3D decks. In practice, the effect is minimal and it strikes us as a sure way to ruin a good film, but fans of the format (and anyone that spent a fortune on 3D glasses and a TV) might disagree. Super Audio CD is supported and if you find any examples of Sony's niche format, their lossless recordings sound great through this deck's HDMI output. No DVD-Audio compatibility though. The so-called Triluminos colour filtering is relevant if you have a Sony TV with Triluminos LED backlighting like the Sony KDL-40W905A and stabilises the colours if you do. Hit the Home button on the stumpy remote control and you'll find a wide range of apps, music and video content all quickly accessible on the home page menu. Alternatively, you press the SEN (Sony Entertainment Network) button for the same services arranged as tiles. All of the popular apps, such as BBC iPlayer, Blinkbox and Facebook are present and there's plenty of up-to-date films available via SEN too, although at £4.99 to rent Gravity in HD, it seems a bit steep. The songs from Sony Music are free, but with no videos, this seems an unlikely way of listening to music. The essential connections are present, but nothing more, which means just one 1.4 HDMI port, one coaxial digital output, Ethernet and USB ports front and back. Either a second HDMI port, or a set of analogue outputs would have guaranteed full compatibility with older AV receivers, but you won't find them here. There are those that love Sony's Xross Media Bar menu borrowed from the Sony PS3 and those that don't and while it might not look as nice as the tiled menu systems found on most rivals, it is undeniable faster to access because it all appears on one screen. The basic but adequate remote control lets you zip through the apps and video content on offer via the Home page without ever having to wait for another page to load. Loading and playing discs is a little faster, at around 28 seconds from closing the disc drawer to reaching the opening credits of a 3D Blu-ray disc. CDs are slowed down by the deck searching for Gracenote track information before playing the first track, but otherwise, it finds your MP3 collection on any other connected device fairly quickly. Given a vibrant Blu-ray disc like The Hobbit: An Unexpected Journey and you will immediately see that this is a step-up player as it is unaffected by motion judder, pixilation, or excessive background picture noise. The colour palette is bold, but not artificially pumped up, so there's no bleeding between especially bright colours. Black levels seem inky enough, but you will notice some graininess in the white areas, which makes them seem slightly grey. Switching from the 2D to the 3D Hobbit disc highlights a particular strength for Sony. The 3D image is particularly vivid and lifelike with no real compromise in brightness or clarity. DVDs are smartly upscaled too, although there is some distortion around the edges of moving images as is so often the case. And provided your amplifier has HDMI version 1.4 ports that can handle a 3D picture and decoded lossless surround sound, the Sony sounds great too. The DTS-HD Master Audio 7.1 mix is utterly enthralling. From its eye-catching design, to the intuitive user interface and stable images, there's a lot to like about the Sony BDP-S5100. Even the free remote control app that runs on your Anroid or iOS device looks slick. If it wasn't so light on rear-panel connections and if the superior Panasonic DMP-BDT330 didn't exist, it would probably be our first choice.